The much anticipated, conveniently sized, versatile bag with rollers and extendable handle by JConcepts. Traveling, carrying and maintaining the organization of R/C equipment is an important part of any race day. 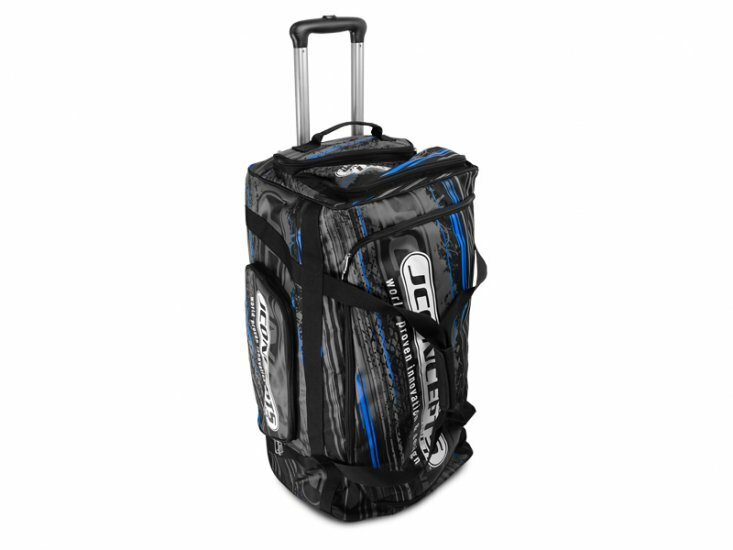 JConcepts, a travel gear leader in R/C racing, introduces the conveniently sized and much anticipated roller bag. The roller bag has an extendable handle for easy toting and a large top opening, capable of storing an assortment of differently sized gear. The roller bag is stacked with front, side and rear pouches for quick access and additional storage. Plastic setting feet, roller wheels and Velcro carrying strap and handles brings functionality into focus. The durable material printed with stylish the JConcepts Striker design elevates the roller bag up to a standard set by some of the most luxurious gear bags in the world. Roll with JConcepts!